10 Channel 2,4 Ghz receiver for Walkera Devention radios. Weight 10g Size : 41.5 (L) X 27mm (W) X 15mm (H). 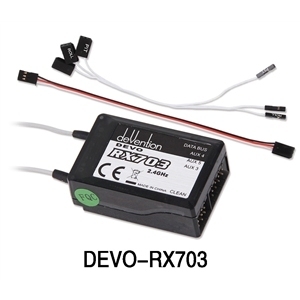 Compatible with all Devo series radios. Special receiver for QR-X350 PRO, with Ch 1-8 PPM out. Type: 2.4GHz 10 channels. CH 1-6 PPM out, Ch 8-10 normal (aux3. 4 and 5). Size : 41.5 (L) X 27mm (W) X 15mm (H). 1). Adopts 2.4GHz Direct Sequence Spread Spectrum (DSSS) that features fast response time and strong anti-jamming protection. 2). Double receiving circuits effectively assure the stability of receiving signal. 3). Feature, a Single Chip Micro processor with extremely fast processing power. 4). Simultaneous signal output increases receiving signal reliability. 7). It can be customized and set as fixed ID and automatically generated ID assignment.